A new report was released today by the Senate Environment and Public Works committee, and it is damning. All this time that climate skeptics are accused of being in the employ of “big oil” is nothing more than a projection of their own greed. Over 7.9 BILLION in funding between these groups. Just reading that first one. Is the American Long Organisation an activist organisation? Organisations that do good work and get money from people who care. Do you mean the American Lung Association? I’ve never heard of the American Long Organization. I think I’ll take a deep breath into my longs and release it in a sigh. Afraid to answer my question Neilio? Or did you miss that one? Well, you see, I have this thing called a job. I can’t sit in front of my computer 24/7. “The Environmental Protection Agency sets the nation’s air pollution health standards. That means regulators get to decide when their own jobs are finished. Not surprisingly, then, federal and state regulators provide millions of dollars a year in funding to environmental groups, which use the money to augment public fear of pollution and agitate for expansion of regulators’ powers. So, yes. The American Lung Association is, if not overtly so, very much involved in the scam. Still not answering my question here. Having trouble reading? You will only say it’s part of the thing, but I can take that as a no to my question. 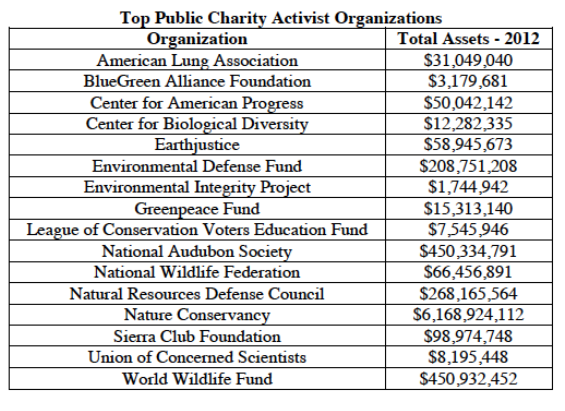 To call all of these organisations as activists is here by flawed. I find that most unfortified information such as yours generally a product of FOX NETWORK. I don’t know if you have looked at the earning of just one of the 5 major oil producers or power companies? If you were correct, $7 billion number is a small number when you consider the results of total environmental destruction. You probably don’t know any more about chemistry than you do about finance but you may enjoy a gulp of coal soot from a regional power company. Or, you may ask what acid rain is and how it effects the death of tree on the Blue Ridge parkway. But…you are a writer not researcher. Coal soot? Acid rain? In China, yes. Here in the US? Not so much. I’m not saying there is no pollution but what there is now is way less than back in the 60’s and 70’s. They’ve really cleaned it up a lot since then. Your not in front of your computer 24/7!? You have about 9000 posts across multiple articles. Get a job hipster. Try 130. And I do have a job. I spend about a half hour on work nights, and a few hours on the weekends, sometimes more, sometimes less, on comments and posting articles. And “your” is not the right word. What you want is a contraction of “you”, and “are” which is “you’re”. You would use “your” to indicate something belonging to, or associated with somebody. Like; “Your car is ugly”. Or, “your head is up your rear end”. Get a dictionary ya goof!! And I didn’t really know what a hipster is, I had to look it up. I think you are quite unjustified in calling me a hipster. I think you are trying to insult me, but that shoe don’t fit bud. Oh, and being a guest blogger here I have access to the dashboard which shows any comments posted, awaiting approval, or spam, so I’m not going over all of the posts. I just use the dashboard to reply and my reply shows up in the post that has the comment to which I’m replying. So it’s not as time consuming as you may think. The American Lung Association IS an activist organization. I don’t believe they started out that way, but the people now running the show are more interested in pushing new laws to control people than in finding cures and treatments for lung diseases. DTN has been cataloging and tracking the money and “leadership” of these folks for years. It will sicken you how deep this subversive revolutionary crap goes. There’s a green right movement as well, want to track them as well? Oh, really? A green Right movement? Care to provide a link? Obviously you don’t think the right are capable of being green. I’m not surprised. No, it’s not that. What you have previously described as a right wing green movement was Newt Gingrich and Nancy Pelosi sitting on a couch in 2006 talking about climate change. Newt has since changed his position BTW. So again I ask, care to provide a link? And almost every one of the above groups has a researched profile page. You guys are the nuts. I agree to that. To put the future of humanity at stake for right wing extremist idea’s for the soul purpose to disagree with the democrats is indeed nuts. @Fietser-Here by should be hereby, one word. Soul should be sole. I’m guessing you went through your formative years fogged in. Wat aree yuo talcing aout? That is just vacuous. What is the Right wing extremist idea? This is about certain people saying that CO2 is causing dangerous warming, and people like me who are saying it is not. I just can not believe it. And I did! In the beginning, I was a believer, believe it or not. But even in that nascent state I had enough sense to know that when someone says “the debate is over”, it means that they just want you to accept what they say without questioning it. And my philosophy is that the debate is over only over when questions are asked and answered satisfactorily, not when the people being asked questions say you are too stupid to understand so just heed what I say. It is just incredible the mental masturbation you Lefties undertake to convince yourselves that you occupy the moral high ground. You think we are putting the future of humanity at stake by asking questions about the product of computer models? Have you ever stopped to ask yourself why the solutions to the climate change problem are all things that Leftist Utopians have been having wet dreams about since before Marx and Stalin assumed ambient temperatures? That last sentence is obvious your motive to deny the warming no matter what. But can you suppose that the warming is true. What would the right wing solution be to prevent further warming? Surely there is such a thing. I deny the warming because there has been none for more than 17 years! I don’t care what the computer models say. You have to look at the real world too, and what the real world is doing is not what the computer models said would happen. Your problem is that you are a victim of the fear that has been produced by all the propaganda. You are afraid, and you think you are doing something useful. But useful to whom? earth to climate change groupies – the climate of the earth has been changing since our world began. we have dinosaur fossils encased in tropical vegetation in Nebraska. Why, you should be asking yourselves. Answer – because at one time, the facts support Nebraska was a tropical region. Climate changing ok – got that fact in your brain matter yet? nothing new here folks, same old same old CLIMATE CHANGE but now you have a group of people who want to dupe you so they can make billions of CLIMATE CHANGE! how stupid they thing you are to fall for this false science! @RealityCheck, what makes you so sure that you know better than all those climate scientists out there that say completely otherwise? Doesn’t it fit your agenda? @Fietser, all those scientists? You’ll find that most of these so called scientists are only self titled after taking science for a year at one of your left wing colleges. If you want to be stupid enough to believe this scam and hand over even more cash for their carbon credit agenda, don’t forget, you’re sucking the rest of us into your warped fantasy. Denying peer reviewed papers and thorough research is not my cup of tea thank you. It’s rather mindboggling to me why anybody would want to do that. Oh, and what left wing colleges are you talking about? Name them plz. Have you heard of climategate? Peer review is not the virtuous unassailable process it may once have been. What good does it do when the peers have all the same beliefs and positions as the paper being reviewed? It doesn’t make a paper correct and true. It does make a paper that abides by current belief and understanding. And if you look at the history of science, belief and understanding are always proved to be wrong in one way or another, sooner or later. But what happens when you have a scientific climate where grants and research funding depends a great deal on which theories you support or not? You get the current state of science where people are afraid to speak out, or report findings that are critical of the current science dogma, which is CO2 causes dangerous warming, because that could jeopardize their funding stream. If you ever graduate, and get into some kind of research that needs funding, you will see that I was right. LOL, left-wing colleges. Thanks Neil- I just checked in for another nugget of humor, and I got it. It means Neillio is against science in general when he sees fit. He can’t even substantiate his claim of left wing colleges because there are none. Science is science so don’t politicize it. That is an unfounded accusation. I am all for science 100% of the time. I am against junk science and the religion of global warming. I don’t think computer models are accurate. They prove nothing and are not evidence of anything other than what the modeler wants it to be. Computer models are not science, they are speculations. Um, what? I wasn’t talking about Left wing colleges. Go back and look. That was Brainsurge. Come on you guys, please don’t attribute things to me that I have not said. UC Berkeley, Brown, Weslyan, Reed, Oberlin, Yale, Vassar, Bard, Hampshire, Bennington, Sarah Lawrence, New College of South Florida and Evergreen State, Mills, Pitzer, Warren Wilson, Marlboro, Earlham, Macalester. It goes on, and on. So even though you think they don’t exist, they really do. Pull your head out of the sand, and take your blinders off. So in that case Mr. Somehow Knowitall, what are the Rightwing colleges? This list of quotes goes on, and on, and on, and on……the science of this is in the MONEY. I admit back in the 90’s I wore save the planet t-shirts but I didn’t have a clue on why I wore them. but I recall in my 6th grade science classes I was taught plants/ trees and vegetation NEEDED CO2 to live and in return give off O2 ,which we need to live, so that is what I go by, not the opposite. I smell a rat in the global warming, climate change, or whatever the next buzz phrase they come up with.